There's a new theater project called "Launching New Plays into the Repertoire," led by The Lark Play Development Center in NYC. The idea is to produce a new play in several regional theaters around the country, because "good playwrights become great playwrights in front of audiences, and good plays become great plays through multiple productions in multiple venues." 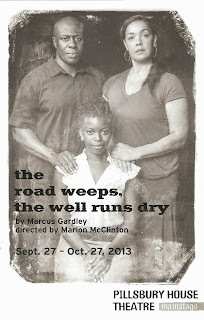 One of the pilot projects is currently playing at Pillsbury House Theatre in South Minneapolis - the road weeps, the well runs dry by Marcus Gardley. The only previous production of this play was in Juneau Alaska, and after the Minneapolis run it will also be produced at theaters in LA and, most appropriately, Florida. 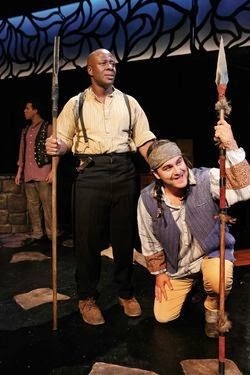 It's a fascinating and epic play about the Seminole Indians and the runaway slaves and free black people who joined with them in Florida in the 19th Century. With a dynamic cast of 11 and the excellent award-winning director Marion McClinton, this mythical and historical drama comes alive. This successful production bodes well for the new project. This play is difficult to describe because of the huge cast of characters, the several decades of history it covers, and the mythology it presents. It feels like a Greek tragedy, in which the characters are destined, or cursed by the gods, to live these difficult, troubled, and interconnected lives. The main character bears a birthmark of a white sun on his chest, and is told that he cannot be killed except by blood (spoiler alert). We witness the establishment of Freetown by a group of Seminoles and free blacks in 1833, the flourishing of the town and its hard working people, the devastation that comes with a drought and wars, and the ultimate redemption and hope as rain comes again after tragedy. Our story centers on two men, the "full-blood" Seminole Trowbridge (Jake Waid, reprising the role he played in his native Juneau) and escaped slave Number Two (another powerful performance by recent Ivey-winner Ansa Akyea). The men become friends friends, companions, partners, and then enemies (there is much discussion of the interconnectedness of love and hate and how that manifests in their relationships with each other and their families). There's also a town shaman called Horse Power (a colorful James Craven), the reverend (Harry Waters, Jr.) and his wife (Regina Marie Williams), the town Casanova who goes through a bit of a transformation (H. Adam Harris), young lovers (sweetly played by Traci Allen and Santino Craven), and warring mothers, one soft and the other tough (George Keller and Keli Garrett). We also see flashbacks of the young Trowbridge (Santino Craven again) and Number Two (Darius Dotch). There's just too much going on to describe it all - death, murder, birth, abuse, love, preaching, punishment, an extremely awkward Sunday dinner - in fact it's a little hard to follow chronologically at times, but the timeline in the playbill helps clear things up. the road weeps, the well runs dry is something that really has to be seen to be fully experienced. The world of Freetown is successfully created by the sparse set (by Dean Holzman), with just a few suggestions of trees, the town well, and wooden crates to sit or stand on. The costumes are beautiful, with full layered dresses for the women, dandy suits for some of the men in town, and more traditional Seminole garb. The cast makes full use of the intimate space at Pillsbury House, including the aisles and the back of the theater; it's a 360 degree experience. the road weeps, the well runs dry is an ambitious and epic new play, and perfect for Pillsbury House Theatre that often produces work that is challenging to the audience. Whenever I see a Pillsbury House production, it's never just a pleasant, nice night out at the theater. Challenging, awkward, difficult, but always thoroughly engaging and rewarding. At the end of the play there's a rain dance to end the long drought, and whatever they were doing on that stage worked. When I left the theater it was raining like it hadn't rained in months. By the time I got to my car I was soaked and freezing, but it somehow felt appropriate, like it was part of the experience to be cleansed by the waters that Horse Power called down upon us all. Playing through the end of the month, I can't guarantee rain, but I can guarantee a fascinating and epic experience.